USES FRESH INGREDIENT AND NO PRESERVATIVES! I love Korean culture and their dramas. So I started learning Korean language and learn to cook Korean cuisines. I was taught by a Korean housewife and this is one of the dishes I love the most. ENJOY! -LOADS OF WAY FOR YOU TO DISCOVER!! You may choose your spiciness level now! Kimchi can be kept for more than 1 month. Longer you keep your kimchi, sourer it will be come! Those who love sour kimchi should it keep longer in the fridge, and also those who want to make kimchi fried rice or pancake. -Payment must be done 2 days before you collect. If not, delivery will be postpone as payment confirm your orders. Now, we offer Home delivery service for S$6.00 (West) & S$8(East). This includes weekends and public holidays and is subjected to the availability of the time slot requested. Delivery rate will not increase no matter how many tubs you buy. Please be present or arrange for someone to be present at the time slot. If no one is present and he/she is uncontactable, a re-delivery may be required and a separate charge imposed. So, grab this opportunity and delight your friends and families TODAY. "...just tried the kimchi yesterday with ramen. Quite nice and authentic.."
"...Your kimchi is really appetizing. My hubby and i enjoyed it ;)..."
"...Just tried during lunch, very nice and fresh. The spicy level is just right for me..."
"...I am so glad that I have chanced upon your thread selling kimchi. 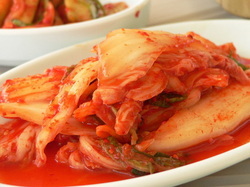 Your kimchi is simply out of this world, authentic, fresh and great tasting better than our best Korean restaurants..."